New. 2007. Library Binding. Hardcover. Iggy Peck has been building fabulous creations since he was two. His parents are proud of their son, though sometimes surprised by some of Iggy's inventive creations (like the tower he built out of used diapers). When a new second grade teacher declares her dislike of architecture, Iggy faces a challenge. He loves building too much to give it up! Illustrator(s): Roberts, David. Num Pages: 32 pages, cl / bw / tt illustrations, cl / bw / tt photographs. BIC Classification: YBC. Category: (JN) Preschool (0-5). Dimension: 242 x 289 x 14. Weight in Grams: 470. 32 pages, cl / bw / tt illustrations, cl / bw / tt photographs. Illustrator(s): Roberts, David. Iggy Peck has been building fabulous creations since he was two. His parents are proud of their son, though sometimes surprised by some of Iggy's inventive creations (like the tower he built out of used diapers). 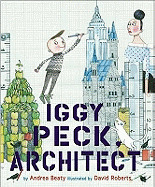 When a new second grade teacher declares her dislike of architecture, Iggy faces a challenge. He loves building too much to give it up! . Cateogry: (JN) Preschool (0-5). BIC Classification: YBC. Dimension: 286 x 238 x 10. Weight: 462......We ship daily from our Bookshop.